Click PLAY to hear from Terrapin and Duck-Rabbit brewers on the night of the dinner. Listen to descriptions of the two amazing, cask-conditioned ales. With four excellent beer and cheese pairings during the reception, two cask ales (firkins), six delicious courses (each paired with a different beer from Terrapin or Duck-Rabbit), and outstanding camaraderie with a big crowd of local beer enthusiasts, this goes down as one of the very best beer dinners ever held in Georgia." Terrapin India Brown Ale is characterized by a rich roasted malt backbone that is balanced by big citrus hops that remind one of a tasty IPA. Sweetgrass Thomasville Tomme - Golden yellow color with mellow and buttery characteristics. Aged more than 60 days to give it a light sharpness that accentuates the toasted malts and the bold hops of Terrapin's IBA. 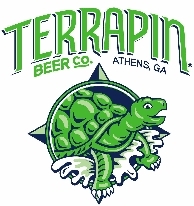 Terrapin All American Imperial Pilsner - Toasty caramel malts with notes of tropical fruits and spice. Finishes with a lingering dry, citrus hop spiciness. Duck-Rabbit Porter - Hints of chocolate and coffee with light smokey notes. Finishes with a silky creamy maltiness. Sweetgrass Holly Springs - Raw goat's milk cheese aged for at least 60 days. The combined flavors of nuttiness and sweetness enable this cheese to have an intricate flavor that pairs well with the rich and creamy complexity of Duck-Rabbit's Porter. Duck-Rabbit Barleywine - Robust, sweet malt backbone balanced with a bold citrus hop profile. Finishes with a lingering hoppy sweetness. Sweetgrass Lumiere - Lumiere is coated and layered with grapevine ash which counteracts the goat cheese's natural acidity. This balances the fundamental flavors of the cheese while complementing the bold malt and hop profile of the Duck-Rabbit Barleywine. A very common on-the-go meal, served with a peanut garlic dipping sauce and a sweet chili glaze. An aromatic summer soup flavored with lemongrass, galangal, cilantro, coconut milk, and kafir lime leaves. A Japanese/French fusion dish with sushi grade tuna. A spicy vegetarian dish from one of the oldest cuisines in the world. One of the Philippines national dishes. Served with steamed rice, shaved daikon, carrot and Thai basil. Includes fortunes from the staff at Trappeze. 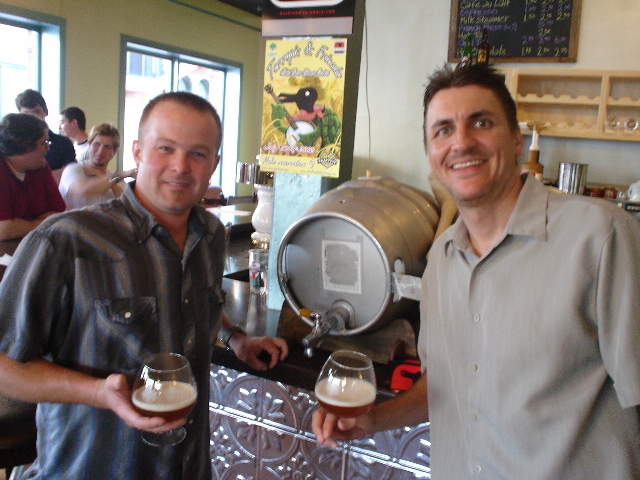 Trappeze co-owner Eric Johnson and Terrapin co-owner & brewer Brian "Spike" Buckowski share a cask ale at the dinner. 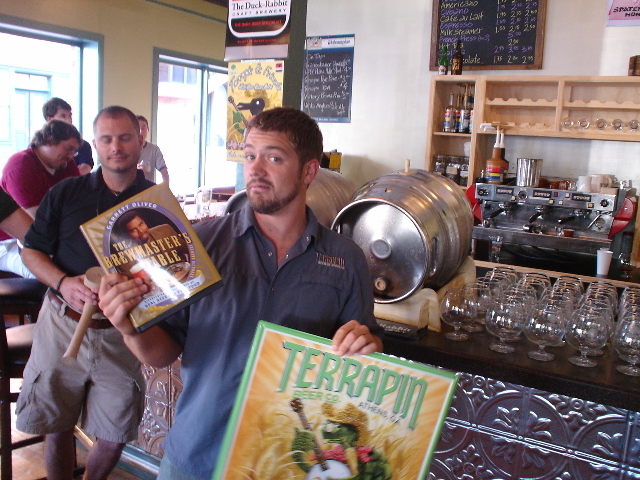 Terrapin's own Dustin Watts quoted from Garrett Oliver's book The Brewmaster's Table.